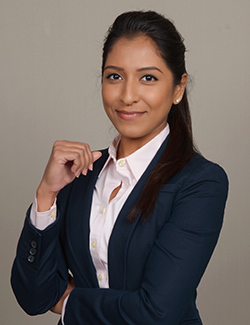 Madhath N. Ali received her Juris Doctor, with honors, from the Michigan State University College of Law in 2015. She earned her Bachelor of Arts in Criminal Justice at Michigan State University in 2012. Madhath N. Ali is a member of the State Bar of California and the Orange County Bar Association. Since 2015, Ms. Ali has defended employers, insurance carriers, and third-party administrators against workers’ compensation claims. She is an aggressive, detail-oriented advocate for her clients while offering personalized customer service specific to each client’s needs and expectations. She has extensive experience at Workers’ Compensation Appeals Boards throughout Southern California. After concluding two years at a workers’ compensation defense firm in Orange County, she joined the Long Beach office of Dietz, Gilmor & Chazen in 2017. In her free time, Ms. Ali enjoys reading, gardening, hiking, and exploring new restaurants.